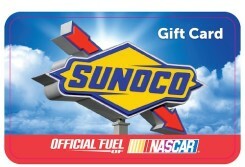 The Sunoco Gift Card can be used at any Sunoco station and is good for purchases at every Sunoco - just like cash. You can pay right at the pump or inside Sunoco locations. Sunoco offers over 4,900 locations in 26 states in the United States. Gift Cards can only be used at Sunoco stations in the United States. For the Sunoco nearest you, please visit us at www.sunoco.navisite.com or call 1-800-SUNOCO1 (1-800-786-6261). SunocoÃ‚Â® is not a sponsor or co-sponsor of this promotion. Use of this Sunoco Gift Card is subject to terms and conditions printed on the cards. Sunoco Gift Cards are issued and sold by SVM, LP. SUNOCO and logo are registered trademarks of Sunoco, Inc. and its subsidiaries.